December wraps up the twelfth chapter and 12 months of The Artist’s Way for this creative. I would only recommend completing a chapter a month if you are ready to have your world rocked. I heard other participating artists talking about needing to stop part way through the year due to blocks surfacing that they had never experienced before. This was true for me as well. Every fear, every block, every experience was intensified sometimes to the point of being too difficult to withstand. On the other hand, I have never accomplished so much, had so many breakthroughs, and been so much at home in my creative skin as I have in the last year. I really came into my own. Artist’s Dates evolved from outings into taking advantage of many live stream courses. Artist’s Pages evolved into long meditations clearing the mind’s negative self-talk/sabotage. Mediation lead to a peaceful and a more positive creative! Chapter 12 is entitled Recovering a Sense of Faith. This chapter reminds us to trust in our Creator–trust that the Devine’s plan for us very well may be in line with our own deepest desires. I pondered back on a time when I had told myself such a clever lie that I even deceived myself. I believed that my artistic and creative talents were lower than a true life purpose. What I mean is, I believed that I needed to be giving some sort of service (for the greater good) in order to be living my true purpose. I believed that my creative pursuits were self-centered and indulgent. I guess I hadn’t considered I could live a life of giving back while being an artist. I had always had a great eye for home decor and visual art. I felt that I would be swallowed up in materialism and worldliness if I dedicated my life to my creativity. Deep down, I had known that I had so much talent and desire to be an artist, but had talked myself out of it on so many levels. I even told myself that I didn’t want to do it as a living because it was too special to me and it would be ruined as a passion. When we take so much time to talk ourselves out of something so important, we should recognize this as the red flag it is. The further I got away from these gifts, the less I felt like me. The final nail in the coffin for me was when bought into the idea of finding a career based on making money. This happened to be in healthcare. What was dangerous for me was that it was a hungry monster with a never ending need for service. Luckily, that is when I discovered The Artist’s Way. I was heading for a degree in social work to be a step in my goal to be a medical social worker (the highest paid in the field of social work). The course brought me back to my authentic self, so doing it for an entire year made perfect sense. It had become my self-care. I had found a mode of healing. Art, creativity, the process had become not about creating bodies of work. It had become feeling and being alive. This year, I learned that God is in the details. He is there wanting you to live your life to the fullest. He wants you to be on fire with purpose and excitement for living. Cameron points out that we have this idea that spirituality is about living a life of scarcity.. never being given permission to be truly aligned with your hopes and dreams. As you learn to have faith that the universe has your back all the while practicing your spirituality and creativity, you find you grow. Your ability to give back increases. Your talent increases. Your reach increases. Learning a craft, an art, or a skill is bonus! There is so much to gain and so little to lose. If you are ready for the most amazing adventure, make your creativity a priority. Make creativity a regular part of your life. This isn’t about being a professional artist. It is about being fully alive. Finding your soul’s truest expression. Honoring your spirit, your voice. Honoring life. This painting was created in Shiloh McLoud’s Awakened Woman live stream class. She teaches a visioning/intuitive/imagination process that is beautiful and empowering. 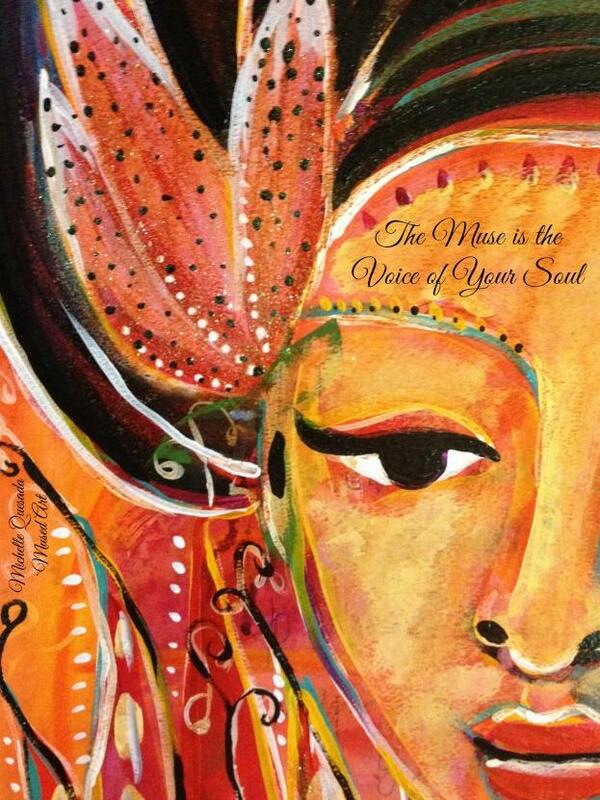 “The Muse is the Voice of Your Soul.” -Shiloh McLoud. Title: “Lady of Fire.” Going deep to talk with my muse. This entry was posted in Artist's Date, I'm Doing The Artist's Way in 2013, Morning Pages and tagged art, Blocks, Breakthrough, creativity, Meditation, spirituality, The Artist's Way. Bookmark the permalink. Michelle what a beautiful post and a wonderful conclusion. I am struggling with chapter 11 and, still have to approach chapter 12. Yes, I admit that this “Way” is the way for us creative souls. I will be recommitting next year to the book again and it’s sequel: “Walking in This World”. I am so impressed that you have managed to finish it in time. I have been diligent and I write my Morning Pages, it’s the Artist Date where I have been a bit negligent with, and some of the tasks are terribly hard. Wishing you a wonderful New Year, and congratulations for this magnificent “Finale”. Blessings and Light to you. Thanks Lisa! The Artist Way has been an influential part of my process for rediscovering my creativity. It was a natural fit. I am very grateful for the opportunity to have a support group this year as well! I feel like it is a lifestyle for me now and I took the parts that fit naturally and the need for discipline just fell away. ❤ I am excited for what's to come in the New Year for us all. Thanks again!